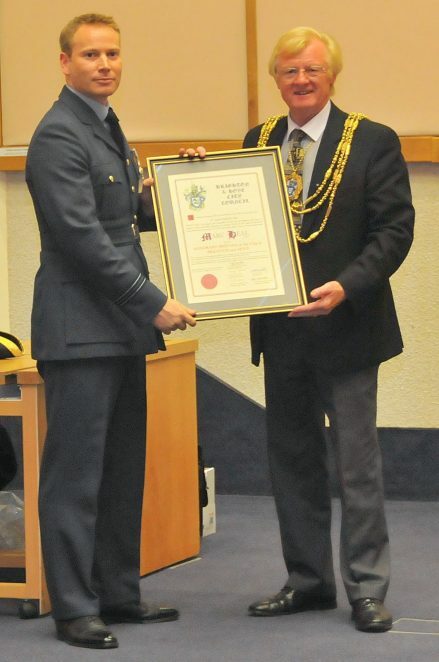 RAF pilot Flight Lieutenant Marc Heal, who is Brighton born, was given the Freedom of the City at a special Brighton and Hove City Council this week; the award was presented by Councillor Geoffrey Wells the outgoing Mayor. Last year, 29 year old Marc was awarded the Distinguished Flying Cross (DFC) by the Queen. The award was in recognition of his outstanding bravery as Captain of the Chinook helicopter Immediate Response Team in Afghanistan, when he rescued twenty nine casualties in the heat of battle.